This series relates the camaraderie and heart-stopping exploits of the Celestians, extraordinary people who live during the tumultuous Warring States Era. Living in a world of their own - a place known as the 'Celestial Zone' - they cultivate special powers beyond the comprehension of mere mortals. Unfortunately, some of them branch into the cultivation of the evil power of corruption, bringing destruction and sorrow to the mortal world. 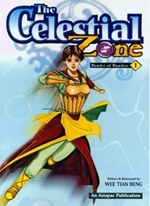 The series centres around the war that starts between the Celestians.